"Highlights include "Abundance," a gentle blend of flowing notes from N. Scott Robinson's sanza and long sustained notes from Dawn Avery's cello." Alchemy: Music for Meditation CD review, Native Peoples Magazine (November/December 2013), 61. "Lost In The Beauty Of It All unequivocally illustrates the exceptional musical artistry of Mark Holland and world percussionist N. Scott Robinson, as both soloists and collaborative artists. N. Scott Robinson is simply one of the finest world percussionists in the business." Lost In The Beauty Of It All CD review by Dr. Kathleen Joyce-Grendahl, Overtones 1 (May 2013): 40. "Wind & Fire explores the special chemistry that can exist between wooden flute and assorted melodic percussion, as superbly played by N. Scott Robinson." Wind & Fire CD review by Bill Binkelman, New Age Retailer 23, no. 5 (Fall 2009), 90. "Listeners will find this the kind of music to which they are, in fact, likely to wish to return to again and again." Things That Happen Fast CD review by Michael Tucker, Jazz Journal International 56, no. 12 (December 2003): 40. "Striking percussion work by Kenny Washington and N. Scott Robinson . . ." Liner notes by Dan Morgenstern from Grammy Award-winning CD Harlem Renaissance by Benny Carter, 1992. "There is an often-quoted Navajo phrase that I think fits the music of the duo Wind & Fire: 'Walk in Beauty.' The duo is comprised of the accomplished world percussionist N. Scott Robinson and Native American/world flute specialist Mark Holland. The two CDs feature an astonishing number of exotic world percussion instruments and world flutes (mostly of the Native American variety) all beautifully recorded in crystal clear sound. Each track listing on both CDs detail the instruments used. Original compositions throughout are built around simple melodies and/or improvisatory rhythmic structures. The earlier CD from 2009, self-titled Wind & Fire, is a good example of their brand of world fusion. One of the instruments featured on "A Most Beautiful Place" is the Milltone steel tongue drum, paired beautifully with a low Redwood Native American flute. This combination, along with some Tuvan overtone singing by Robinson, is mesmerizing. Lost In The Beauty Of It All (2013) breathes with a slightly more mature and refined worldliness. 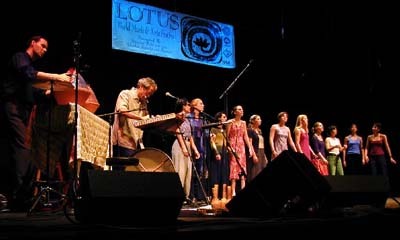 A highlight for me is the soaring and joyous "In Remembrance (Honoring Our Fathers)," which features Robinson on the mbira dza vadzimu and Holland on a Bamboo bansuri flute. I’ll be whistling that tune for a while. This CD also contains the most whimsical of all their collaborations, "The Traveler Encounters Bigfoot," in which a variety of atmospheric birdcalls give way to, what I can only describe as, a mysterious toe-tapping finale. There is depth in the musicianship of both players. Robinson's skill on a vast array of instruments is remarkable and because of Holland’s dexterity and musicianship, he has become known as 'the Jimi Hendrix of the Native American flute.' My feeling about this music is that its roots go deeper than something as superficial as a label. It hints at something much older, something ancient: sounds, instruments, rhythms, and melodies that transcend their original cultures and are brought together here in a celebration of beauty." Wind & Fire and Lost In The Beauty Of It All CD reviews by John Lane, Percussive Notes 52, no. 2 (March 2014): 68. "One of the issues that I think is essential for succesful music practice is to involve the mind in everything you do. Percussionists often spend a great deal of time doing 'physical practice,' such as running scales on mallet instruments, snare drum rudiments, or drumset time-keeping, without really thinking deeply about everything they are playing. I noticed improvement in my focus and concentration after having practiced things that required a great deal of thought to execute." From "Insights on Practicing World Percussion," interview excerpt by B. Michael Williams, Percussive Notes 41, no. 2 (April 2003): 44-46, 48. "The compositions are strong, and Robinson should be commended for the unique timbres he blended in each one. World View is a breath of fresh air." World View CD review by Lisa Rogers, Percussive Notes 41. No. 6 (December 2003): 70. "N. Scott Robinson has composed a driving five-minute work for two intermediate players of the Arab tambourine." Review of Mirage score by Terry O'Mahoney, Percussive Notes 41, no. 6 (December 2003): 57-58. "This piece affords an excellent opportunity to appreciate one of the lessons learned in the study of hand drumming—that a single, simple frame drum played with the fingers can be the source of an amazingly varied palette of sounds, as well as a musically satisfying and captivating performance." Review of Handful score by John R. Raush, Percussive Notes 41, no. 6 (December 2003): 58. "The interplay between the two players creates an interesting rhythmic feel as well as tonal colors with the use of hand slaps, jingle taps, and contrasting head effects. For those wishing to include world music on an ensemble or recital, this piece is ideal." Review of Bear Talk score by George Frock, Percussive Notes 41, no. 6 (December 2003): 58. "Shaken, Not Stirred will definitely excite an audience!" Review of Shaken, Not Stirred score by Lisa Rogers, Percussive Notes 41, no. 6 (December 2003): 58. "This fast moving and challenging solo would be an excellent encore to a percussion recital or a feature solo on a world music program." Review of Il Mano score by John H. Beck, Percussive Notes 41, no. 6 (December 2003): 58. "As far as the original selections that feature his hand drumming artistry are concerned, Robinson can indeed claim to have found 'his own sound.'" Things That Happen Fast CD review by John Rausch, Percussive Notes 40, no. 4 (August 2002): 78. "Robinson speaks clearly and knowledgeably, and he demonstrates ideas in a manner that can be easily understood." Video review of Hand Drumming by John Beck, Percussive Notes 35, no. 6 (December 1997): 70. "And for those who can appreciate the most precise and clean technique of N. Scott Robinson, listen to his solo pieces on Things That Happen Fast . . . Robinson is a musician we hope to see in our country soon." Things That Happen Fast CD review by Peppe Consolmagno, Percussioni 13 [Italy], no. 133 (October 2002), 9. "That he has mastered his instruments and has studied the masters well is evident in every tone." Things That Happen Fast CD review by Heinz Kronberger, Drums & Percussion 3 [Germany], (May/June 2002), 97. "It's an excellent album. This makes World View a gem of world progressive music. The disc recalls echoes of Oregon, Trilok Gurtu, Aktuala, and Ancient Future." World View CD review by Donato Zoppo, Movimenti Prog [Italy] (March 2005). "Wind & Fire is fresh and alive, with pure melodic explorations and the most comprehensive, skilled world percussion playing that I have heard to date. Mark Holland’s and N. Scott Robinson’s Wind & Fire is a compelling, masterful musical achievement." Wind & Fire CD review by Dr. Kathleen Joyce-Grendahl, Voice of the Wind 7, no. 2 (2009): 24-25. "The world percussion of N. Scott Robinson is quite skilled, as usual. A gifted world percussionist, N. Scott uses an array of percussion instruments from all over the world, which provides musical and atmospheric interest throughout the CD. Scott's use of rhythmic interplay with melodies and countermelodies is enthralling. Being quite creative and expansive with his instrument choices, he provides a unique rhythmic character, which truely enhances each song." CD review of Progressive World by Dr. Kathleen Joyce-Grendahl, Voice of the Wind 4 (2002): 27. "Flutist Mark Holland and world percussionist N. Scott Robinson dazzled the Eliot Chapel audience for 90 minutes with musical magic. The two musicians were in a zone feeding off of each other's creativity and skill, providing the audience with intriguing musical journeys spanning the globe." Wind & Fire concert review by Mya Duran, Voice of the Wind 2 (2002). "N. Scott Robinson is a musical conjurer; the audience loved it!" Concert review of N. Scott Robinson with R. Carlos Nakai and Gary Stroutsos by Audrey Burk, Voice of the Wind 1, no. 1 (2002): 21. "On Wind & Fire, the talented flutist Mark Holland is paired with tuned, melodic percussionist N. Scott Robinson, and their marriage is made in musical heaven. Wind & Fire is equal parts passion and subtlety." CD review, Inspired Retailer (2009). "An interesting treatment of a unique musical avenue." Video review of Hand Drumming by Victor Rendón, Modern Drummer 21, no. 8 (August 1997), 130. "N. Scott Robinson is a drummer/percussionist who has taken a different path than most of his peers. Although he has studied with such drumset artists as Peter Erskine and Keith Copeland and performed with jazz great Benny Carter, Scott has put his emphasis on percussion that draws from music of other cultures. His effort is based on intensive studies with great hand drummers like Glen Velez and Nan� Vasconcelos, and with orchestral percussionist William Moersch." Excerpt from article "On The Move: N. Scott Robinson," Modern Drummer 20, no. 2 (February 1996), 126. "Annea Lockwood’s Thousand Year Dreaming opened with an arresting effect I’d never heard before: Art Baron and N. Scott Robinson, blowing through conch shells, played a series of converging glissandi in opposite directions, creating wild beat patterns as their pitches neared each other. In between solos and rubbed gongs, I got what I listen to music for: chills up my spine." Concert review of N. Scott Robinson & Art Baron with Annea Lockwood Ensemble by Kyle Gann, The Village Voice (2 January 1991), 71. "Elodie Lauten streamlined her style, playing mellow jazz patterns of early Terry Riley with percussion by N. Scott Robinson including a nice steel drum solo." Concert review of N. Scott Robinson with Elodie Lauten by Kyle Gann, The Village Voice (15 May 1991), 86. "When Glen Velez's trio shifted to a frame drum quartet with N. Scott Robinson, I figured it was a throw away piece to give Steve Gorn a rest. Instead, it was the evening's climax: hot cross-rhythms, shifting meters, and somehow a catchy melody, with just four goddamn drums!" Concert review of N. Scott Robinson with Glen Velez by Kyle Gann, The Village Voice (24 October 1989), 88. "World View is a truly exotic blend of instrumentation providing many subtle timbres and tones. The world music concept is befitting of N. Scott Robinson's extensive experience in teaching, workshops, studying, and performing over the years. This recording has a lively edge to it and is certainly not a sleeper!" World View CD review by P.R. Brimstone, World Rhythm 3, no. 1 (September-October 2004), 13. "Oxymora produced elegant, spirited, inventive, fresh music. The rich variety of their creativity was strongly present. "Shaken, Not Stirred" by N. Scott Robinson was a 4-minute solo on the riq (Arab tambourine). Four arresting sounds from one tambourine all at once! Sheer acoustical fun. The innovation of this group deserves wider recognition." Concert review of N. Scott Robinson with Oxymora by Bob Sherwood, Clarke Times-Courier [VA] (29 June 2006). "They stopped just short of dancing in the aisles as Malcolm Dalglish and N. Scott Robinson brought their rhythm and sound to Westover School. The soft sound of Dalglish's hammer dulcimer echoed through the room and Robinson created a backdrop of sound effects with tambourines, wooden bowls, and an assortment of world percussion." Concert review of N. Scott Robinson with Malcolm Dalglish, Republican-American [CT] (March 2001). "Pleasure provides a broad sweep of musical forms: ballads, mouth music, lullabies, laments, old hymns, and dance songs. Dalglish's hammer dulcimer accompaniment heard throughout the recording is perfectly complimented by the delicate polyrhythmic textures of Glen Velez and N. Scott Robinson's frame drums, shakers, udus, and mbira." Online CD review of Pleasure by Ben Kettlewell, Alternate Music Press: The Multimedia Journal of New Music (1998). "In the last movement of Thousand Year Dreaming, a deluge of flurrying frame drums are added, which a quartet of didjeridu overcomes played by such artists as Jon Gibson, N. Scott Robinson, Art Baron, and Libby Van Cleve. It is a lengthy four-movement work full of vibrancy and subtlety, certainly awakening and releasing the power of sonic energy." Thousand Year Dreaming CD review, Experimental Musical Instruments 9 (June 1994). "The USA has always been a creative place at least musically speaking—with people coming from all over the world to our urban areas, the cities here act as zones of cultural interaction so ideas get exchanged pretty freely. People who have a deep tradition tend to hold on to it while those that do not often end up creating their own. I think that’s what started happening in the US in places like New York in the late-1960s-1970s as far as the work of percussionists such as Airto Moreira, Dom um Romão, Collin Walcott, John Bergamo, Naná Vasconcelos, Glen Velez, Zakir Hussain, and over in Europe with artists such as Trilok Gurtu and Okay Temiz to mention just a few." Two-part N. Scott Robinson interview excerpt by Scott Davidson, World Percussion & Rhythm 11, no. 2 (Fall 2010), 8-9, 17 & World Percussion & Rhythm 12, no. 1 (Spring 2011), 14-15. "For me, the tambourines and frame drums offer such a rich assortment of timbres on a small, soft instrument on which I use my fingers as opposed to a large assortment of loud instruments struck with sticks. It fit my quiet personality more so than the drumset did so those kinds of instruments became my focus. The other thing that was going on was my mixing rhythmic and technical ideas on all of these instruments and drumset and jazz were big components in what I was developing on tambourines and the other ethnic percussion." N. Scott Robinson interview excerpt by Mark Holdaway, Kalimba Magic News 2, no. 2 (1 March 2007). "I am really attracted to the fusion of ideas and instruments from different kinds of music and culture. I grew up at a time when this was quite common in the USA so the view that one has so much to choose from is the way I approach music. The problem is finding the proper context to continue this kind of music-making. The music business is really saturating people with the same kinds of music to the point that very meaningful kinds of music have been very under-exposed for a long time now. I think people will respond to something new when they find out that there is so much more to choose from than what you find in a store, magazine, TV, or on the radio." N. Scott Robinson interview excerpt by Iasen Kazandjiev, Ethno, Art, and World Music [Bulgaria] (1 November 2002).